By the late 1980's, Mongolia had been a satellite of the Soviet Union for nearly 70 years. * With the advent of perestroika (government restructuring) and glasnost (openness in government) in the Soviet Union and the Eastern Communist bloc countries (Poland, the former Czechoslovakia, Hungary, etc. ), the political climate became favorable for Mongolia's full independence. In 1989, a group of young professors and activists formed the Mongolian National Democratic Union, which organized numerous demonstrations to democratize the political and social atmosphere in Mongolia. In the spring of 1990, many Mongolians demonstrated for democracy. The Mongolian People's Revolutionary Party (MPRP), which had monopolized state power since 1921, decided to yield to the demands of the people and launched extensive reforms. In June, the MPRP allowed open elections for a new parliament that would draft a new Constitution. Although the MPRP won 62% of the votes, 4 members of the opposition (democratic) forces were included in the newly formed government. This parliament presented a new constitution to the voters, who ratified it in February 1992. 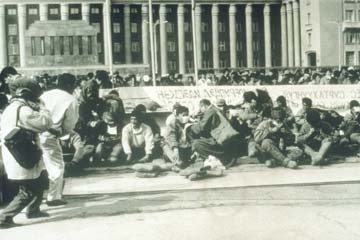 A peaceful demonstration for democracy in 1990, Suhbaatar Square (in front of Parliament),Ulaanbaatar, courtesy of the National Museum of Mongolian History. "In the spring of 1990, many Mongolians demonstrated for democracy. The Mongolian People's Revolutionary Party ... decided to yield to the demands of the people..."
Elections in the spring of 1992 yielded 71 seats to the MPRP and 5 seats to the newly formed Democratic Coalition. In the local elections, the MPRP won all seats. During this time the public widely supported the MPRP as it favored gradual economic reforms and provided subsidies for certain foodstuffs, whereas the Democratic Union promoted speedy economic deregulation and cutting the budget deficit. In October 1992, the Mongolian Democratic Union became a political party along with a number of new parties that banded together to endorse P. Ochirbat for president. * He won the presidential election in an overwhelming victory. 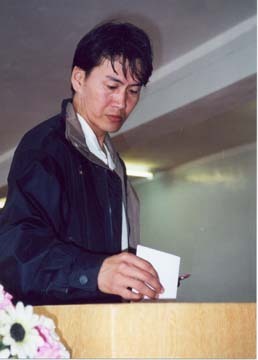 A man places his presidential ballot in the ballot box, Ulaanbaatar. In July 2000, a national election brought the MPRP back into power when it gained 72 seats in Parliament and formed the Government (Prime Minister and Cabinet) without any opposition. Following the election, the opposition parties, which had divided into separate parties before the election, began taking steps to reunite into one large opposition party once again. In May 2001, President Bagabandi was reelected, affirming a government and presidency of MPRP members.